Globalization. The key ingredient to modern day business practices. The world is shrinking and become more connected, with that in mind creatures Brandon Ducharm and James Chheng founded Made Market. 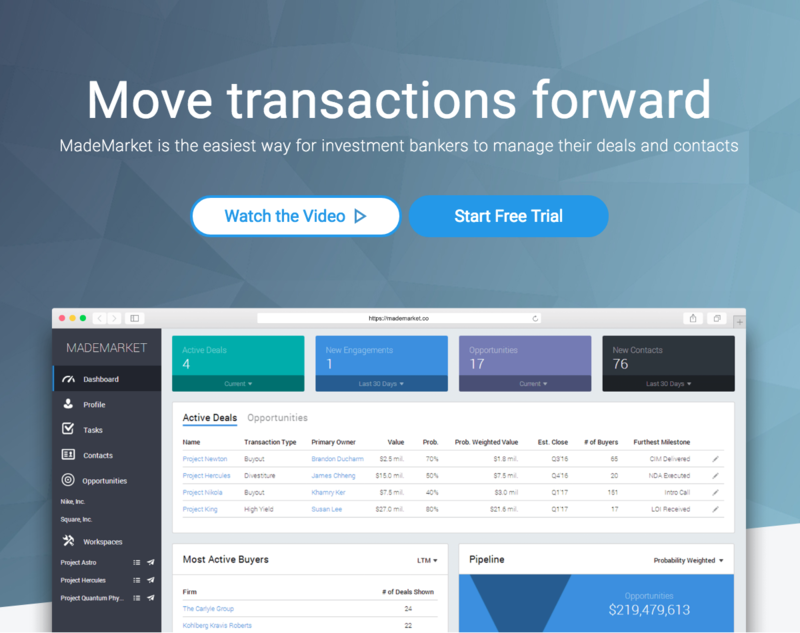 Made Market provides investment bankers with an intuitive system of record keeping and easy-to-use tools for executing transactions. Integrating systems and programs that are commonly used in investment banking, with an adaptable and secure work space, Made Market creates a platform for communication and collaboration that has never been seen before. "We're building a product that empowers teams to move transactions forward —and produce great results" -says the Made Market team. With this in mind Visceral Artist created a website that can showcase the simplicity and ease Made Market offers to their clientele. Founded in Los Angeles, CA in 2013 Brandon and James were on a mission of efficiency. Their message of hard work through Excellence, craftsmanship, empathy, and playfulness alloud their product to stand out in the corporate world. Today you can see the fruits of their labor in the satisfaction of team-members and customers alike. This kind of simple elegance is what Visceral Artist prides itself on. We are on a mission to create the most user friendly and integrative websites and services that are available on the market today. If you would like more information about how Visceral Artist can help your business, visit our services page on Visceralartist.com or check out facebook.com/visceralartist and contact us today.